There was a stage… when, I mean, during the first… just at the beginning of the war… we were in England, and then when the war started we were sort of stuck here. My father had to go back, and then we… later on we followed and we went through France just before the collapse of France. And we went to the Lebanon, and I was at that stage put into a school in the Lebanon because it was, sort of, still during the school term and I had to go to a school which was a quite different kind of school – French type school – totally different kind of education. I survived for a… only there for, I think, a term and I wouldn't have liked to have stayed there much longer. So my schooling wasn't that disturbed by the travelling around. That was the only time when I had a sort of bit of strange surroundings. But the travelling, I think, as children you enjoy it. And we did the journey back from Khartoum to Cairo on our own, my brother and I – my brother's two years younger – when I was 12 and he was 10 we would do this four day journey involving one day on the train, two days on the Nile steamer, another day on the train, all on our own, with a few people helping us when we got to the station. And I think it probably develops a bit of independence and you know, resilience as you get used to that sort of thing, you're not so dependent of other people chaperoning you around. So I think it was probably helpful. My father's position was in the… he was with the Sudan government and he was the… he took over the job in fact from his uncle before him. And the job really was more or less kind of liaison between the British government and the Sudanese, because my father went to Oxford and English educated and so he could put the British point of view to the Sudanese, and he knew the Sudanese. So was kind of the go-between… between, in the political service, between the Sudan government and the Sudanese. And then during the war he got involved with the broadcasting, you know, Sudanese radio and that side of it. So it was an interesting job and then led right up to when the Sudan became independent at the end of the war, launching that movement. And then after the war when he came to this country he was more freelance and he tended to… he wrote, he wrote a lot of books and also did a lot of broadcasting for the BBC and taking part in writing for the media, political, on general political questions to do with the Middle East. So he was Civil Service, moving into the political area and enjoying himself writing books on the side. So it was quite a varied sort of background, but very much you know, a non-mathematical one. He studied history and nobody else in the immediate family was at all mathematical. But it meant that I had a kind of cultured background and lots of books round the house. I was introduced to, sort of, literature and music and art things in a way that perhaps my own children didn't perhaps get such exposure to. 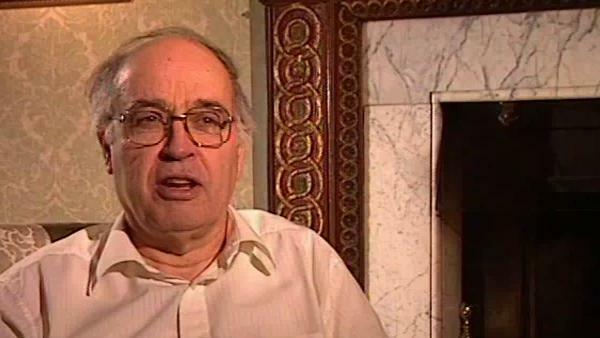 Eminent British mathematician Sir Michael Atiyah (1929-2019) broke new ground in geometry and topology with his proof of the Atiyah-Singer Index Theorem in the 1960s. This proof led to new branches of mathematics being developed, including those needed to understand emerging theories like supergravity and string theory. Professor Nigel Hitchin, FRS, is the Rouse Ball Professor of Mathematics and Fellow of Gonville and Caius College, Cambridge, since 1994, and was appointed to the Savilian Professorship of Geometry in October 1997. He was made a Fellow of the Royal Society in 1991 and from 1994 until 1996 was President of the London Mathematical Society. His research interests are in differential and algebraic geometry and its relationship with the equations of mathematical physics. He is particularly known for his work on instantons, magnetic monopoles, and integrable systems. In addition to numerous articles in academic journals, he has published "Monopoles, Minimal Surfaces and Algebraic Curves" (Presses de l'Universite de Montreal, 1987) and "The Geometry and Dynamics of Magnetic Monopoles" (Princeton University Press, 1988, with Michael Atiyah).